Andrew Codrington: Social Networking Naked - In The Shower! Social Networking Naked - In The Shower! 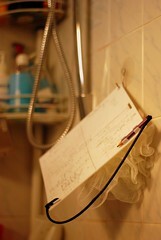 A while ago a special someone mentioned they had their best ideas in the shower, but couldn't write them down. Some googling turned up the idea of using a diver's slate and I was ready for the next gift giving occasion. They're basically a rough plastic board with a pencil attached. You can use regular eraser to wipe it clean, or if you want to be legit bring home some beach sand which is apparently what the real divers use. We've ended up dividing up the board into areas for each family member and notes are written to each other from time to time. I wasn't the first to think of using a divers slate in the shower, but I think I'm the first to realize it's social networking. Now I just wait for the multi-million $ valuation to roll in! I got mine at Sharky's Scuba here in Ottawa, but they're easy to find online.